The 1940 NCAA Men's Division I Basketball Tournament involved 8 schools playing in single-elimination play to determine the participating champion of men's NCAA Division I college basketball. It began on March 20, 1940, and ended with the championship game on March 30 in Kansas City, Missouri. A total of 8 games were played, including a single third place game in the West region. 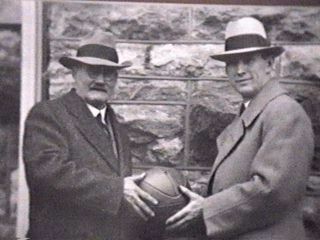 Indiana, coached by Branch McCracken, won the tournament title with a 60-42 victory in the final game over Kansas, coached by Phog Allen. Marvin Huffman of Indiana was named the tournament's Most Outstanding Player. At the time of this tournament, the National Invitation Tournament was the premier college basketball tournament, thus not being officially recognized as one of Indiana's three national titles. Indiana finished second to Purdue in the Big Ten, but district officials sent the Hoosiers to the NCAA tournament because of their two regular season wins against the Boilermakers. Good choice. Indiana, led by All-America guard Marv Huffman, won the eight-team tournament, beating Big Six representative Kansas by 18 in the final. NCAA moved the Final Two to Kansas City in search of more exposure. Colorado and Duquesne, both early round losers in the NCAAs, went to New York and ended up meeting in the NIT final. The Buffaloes won, 51–40.